Honesty of the individuals with the group to allow for expression of struggles, failures, anger, etc. Confidence that one can entrust private knowledge of oneself to others in the group without its being misused. Members should be free to work through troublesome feelings that arise in them during a meeting by expressing them within the group. Someone may feel offended by what another member said in the meeting or someone else may feel irritated by the lengthy or angry way another member expresses himself. It is perfectly proper to express these feelings in appropriate ways within the group. This can lead to bringing the feelings under control and to development of maturity in communication. Struggle is expressed, but the discovery of strength finally emerges. Acceptance of different levels (stages) of growth, different life-styles, different denominational affiliations, and of possibly irritating personal peculiarities (for esample: mode of dress). At first new members may expect more support than they receive. They may experience disappointment and a certain amount of emotional withdrawal. Once they have learned to express to the group their disappointment, they begin to grow and the group gives more care. Eventually, the person becomes aware that it is just as important to give support as to receive it. At that point, deeper growth begins. As the group matures, though there may be some turnover, a regular number of people will stay with the group even after their own need of it has ended. These will become the “givers” and will be able to head off some of the early disappointment experienced by the new members. Generally, mature friendships cannot be expected in H.A. chapters because most members are not appropriately sensitive to the needs of others since they are in too much emotional conflict themselves. Paradoxically, group members develop limited friendships within the group when they become mature enough to give care and love rather than just demand and seek friendship. The reality of this possibility must be faced. Distributing and explaining the New Member’s Card will discourage sexual involvement within the group and sets up ways to deal with it should it occur. One might say, “All of us are committed to finding freedom from homosexuality but still struggle with it. We are responsible to strengthen each other in times of weakness. Thus, if you ever feel uncomfortable about anything in your relationship with a group member, please bring that matter to them directly. You may be helping them avoid a fall. If you are ever asked to engage in improper behavior or are inappropriately touched, please discuss the problem with senior members of your H.A. group. We do not believe in blame or condemnation nor in casting anyone out of our group who desires to be free. All that we ask is that you join with us in helping each other confront our problems and learn to live in freedom from homosexuality together.” If problems develop, the natural inclination might be to exclude those involved sexually from the group. In our opinion, this reaction might stem from a fear that the group is losing control. Remember that the only requirement for H.A. membership is a desire to be free from homosexuality. It is possible to desire freedom while being sexually involved. Loving confrontation by senior members of the group followed by the progressive dynamics of reconciliation is better than exclusion. 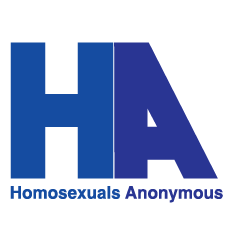 It has been our experience that either the persons involved finally exclude themselves from the group because they become aware that freedom from homosexuality is not, after all, their priority, or they finally break the sexual involvement. Great patience is needed for true growth to emerge.